The Department of Planning and Development regulates land development in Houston and within its extraterritorial jurisdiction (ETJ). The city of Houston does not have zoning but development is governed by codes that address how property can be subdivided. The City codes do not address land use. The Department checks subdivision plats for the proper subdivision of land and for adequate street or right-of-way, building lines and for compliance with Chapter 42, the City’s land development ordinance. Development site plans are checked for compliance with regulations that include parking, tree and shrub requirements, setbacks, and access. The City amended Chapters 42, 33, 39 and 40 for development related items. Click here to view the ordinance. Use our Sign-up Form to get updates on Development Regulations delivered to your inbox. The new fee schedule will become effective January 1, 2019. The new fees will apply to applications submitted on or after the effective date. Click here to see the fees. 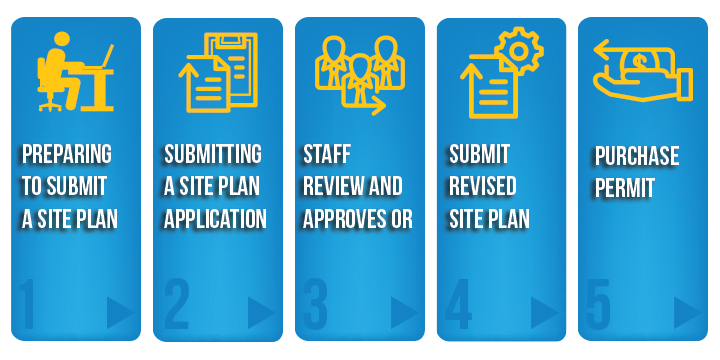 Located at the Houston Permit Center, 1002 Washington Avenue, the Planning and Development Department Site Plan Review is one of the steps in the building permit process. Plan Analysts review plans for new structures, additions and remodels to ensure compliance with lot size requirements, building setbacks, parking, and landscaping. If you don't find the information you need or if you have questions about the information presented here, please call the Planner of the Day at 832.393.6624. Thank you!